“Oh no..not again….I don’t want to undergo surgery again….how do I get rid of this bump on my eyelid that occurs again and again…? The bump on the eyelid, called as chalazion, is usually caused when there is a blockage in the drainage duct of the oil gland (that serves the purpose of moisturising the eyes). It is usually painless, nodular and chronic. It may increase in size over the weeks. What is the treatment for chalazion? Conventionally, the standard treatment is to surgically get the lump removed. But, with homoeopathic medicines, it is possible to save your eyelids from getting under the knife. Homoeopathy can wonderfully dissolve the lump completely. Staphysagria is a good remedy for recurrent styes and chalazae when the chalazion are commonly found on eyelids near the angles of eye, particularly the inner. Staphysagria is indicated when the chalazion is accompanied by a feeling of heat in the eyeballs. 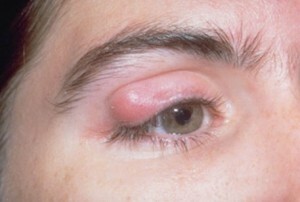 Patients requiring staphysagria often complain that the margin of their lids itch. Their eyes feel dry despite lachrymation. Pulsatilla is a good remedy for chalazion that exude thick yellow profuse bland discharging pus on pressure.This remedy is indicated for recurrent styes and chalaqzion that are accompanied with acrid lachrymation and swelling of the eyelids. The itching and burning in eyes causes the patient requiring this medicine to constantly rub his eyes. Pulsatilla is one of the best homoeopathic remedies for chalazion when there is dimness of vision with a sensation as though there were something covering the eyes which the patient wishes to rub or wipe. Plantanus is a good homoeopathic medicine for chalazion, especially in kids. This is indicated for both acute and old neglected cases, where scar formation has caused marked deformity of the eyelid. Thuja is a good homoeopathic remedy for chalazion when the eyelids are agglutinated at night from the discharge. The eyelids feel heavy as lead and may be dry and scaly. Patients requiring Thuja often feel as if cold air was streaming out of the head through their eye and feel better when warmly covered. Silicea is another good homoeopathic remedy for chalazion in which the angles of eyes are affected. This remedy is also indicated when there is swelling of the lachrymal duct. Patients requiring this remedy for chalazion often complain of being sensitive to light, especially daylight which produces dazzling, sharppain through eyes. Their eyes are tender to touch and the complaints are worse when closed. Homeopathy is practiced on the principle of individualization. A homeopath considers various factors such as mode of onset, the side of head affected, triggering or increasing factors, factors that decrease the symptoms, any peculiar features before, during and after episode, etc. Even the dose and potency of the medicine is decided accordingly. Hence, it is advised that patients take the medicines under the guidance of a good homeopath and avoid self-drugging of homeopathic medicines. I have been suffering from chaljon since 9 years . My eye lids are looks like angel. Now iam 33 years old. Is it possible to solve the problem of my bloked glands . Give me suggestions . I have been suffering from an eye stye problem in both my eyes since 5-6 months now and it feels really bad to look at my own eyes. I want to get rid of this if possible without a surgery. I am presently in the US. Is there a way where I could get any homeopathy medicine that I could order from here? Your suggestion and advice would be helpful. Yes, We do treat a recurrent stye. In order to guide you correctly for your query, we request you to provide your contact detail so one of our expert doctors will contact you or you may call us on 315-351-0898 or write to us info@lifeforce.in. Meri Aakh me funsi ho gyi hai..
3 mahine ho gye hai or ek gaat jaisi ho gyi hai. Aapke problem ka sahi ilaaj batane ke liye aap please hamein yahape email kijiye info@lifeforce.in. Agar aap ko humare doctors ke sath phone pe baat karni hai to call kijiye + 91-22-66-888888. I have been suffering from chalazion since 6 months. Please suggest me without oprtn. I have been suffering from chalazion on both eyelid’s from past 3 months. One I got removed surgically, as it was quite big .Now there are 2 lumps on the left eyelid and 1 small lump on the right eyelid. Kindly advice and help me to get rid of this problem. Chalazions can be very significantly treated with homeopathic medicines. In cases where Chalazion has been surgically removed earlier homeopathic medicines is the best choice as it not only treats the new Chalazions but also removes the recurring tendency of developing Chalazion. For more details, you can refer to the following link: https://www.askdrshah.com/app/chalazion/chalazion-get-details-treatment.aspx. For the consultation, you can send your query by clicking on “https://www.askdrshah.com” or through chat with our doctors.